As you may know by now, Jordan and I are big fans of drilling. It’s very rare that we don’t do some drilling when we go out and play. Like very, very, very rare. Basically, it never happens. It’s pretty standard that we spend almost as much time drilling as we do playing. That said, drilling alone won’t do you any good if you’re doing the drill wrong or if there’s a flaw in your technique. I coach pickleball but I still also coach a lot of tennis. We have a ball machine at our club that’s free for all members to use and I see people using it very often. I often see the same people using it regularly. The one downside, and it’s a big one, is that I see many people drilling a stroke and there is a MASSIVE flaw in their motion. Often, there’s more than one flaw. Unfortunately, they’re engraining a bad motion into their muscle memory. And what’s worse, is that a lot of reps with a bad motion can lead to injury. Fortunately, many of those people are taking lessons and I do see those flaws ironing out over time. However, some of the worst offenders I’ve seen, meaning the ones with the BIGGEST flaws, aren’t doing much to try to correct it. One of the best ways to make sure you’re not doing that without taking a lesson is to see yourself on video and compare yourself to someone you know is doing it correctly. It’s super easy to do this. The next time you’re out there drilling, whip out your smartphone (likely you have one) and ask a friendly bystander to film you. Just 15-30 seconds is plenty. Look at your motion and compare it to one of our videos of that motion. On every Youtube video there is an option to slow down the playback speed. So, if you want to see a shot in one of our video in slow motion, simply click on the little gear icon at the bottom right of the video, go to “speed”, and reduce it. No doubt there is a video for you because we have pretty much every motion covered in at least one of our videos. A really good shot to take a close look at to make sure you have it dialed in correctly is your dink. 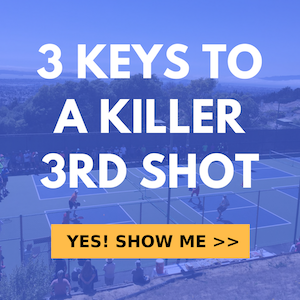 Not only is the dink itself critical to the game of pickleball but it’s also fundamentally similar to a drop. A drop is basically a dink from deep in the court therefore the core of the motion is very similar. It’s simply a more extended version of a dink. If you’re messing up your dink then there’s a good chance your drop is suffering from the same problem or problems. In the video at the top of this post, we cover two of the most common reasons people mess up the dink. If you’re doing one of these then you’ll want to fix it immediately. We also show you what to do instead.